Cards Against Humanity (CAH) is one of the brilliant card games of our time. Sure, groups of nerds, Google+ users, and whackjobs probably obsess over it too much, but with a couple of adult beverages and a group of friends that have darker sides you want to get to know better (or at least laugh at), it can be a ton of fun. 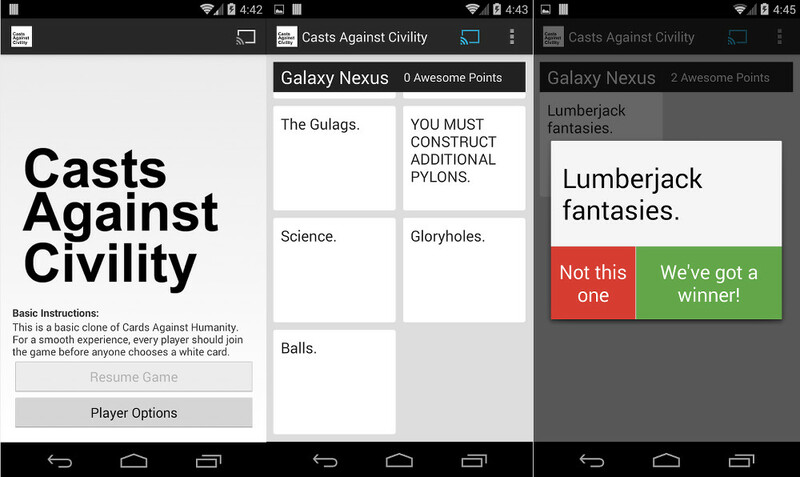 Casts Against Civility is a Chromecast clone of the game that aims to get you and your friends using your Chromecast for something other than YouTube and a pirated collection of…stuff. For those not familiar with the concept, CAH starts out like a typical card game. Someone in the group begins as the dealer and chooses a black community card that has an odd, gross, hilarious, or questionable sentence, word, or phrase on it. The rest of the group then takes to the stack of white cards that were dealt and decides which card fits with the black card or may at least be creative or hilarious enough to get the dealer to choose it. The fun comes from the content of the cards. They are vulgar. They are dirty. They are classless. They are hilarious. In Casts Against Civility, the game (though not affiliated at all with CAH) plays in a similar manner. Users all download the game and connect via phones to a Chromecast. They can name themselves, are dealt white cards automatically, and can simply tap to choose a white card to play against the automated black card that has displayed on the screen. The black card attaches to dealers throughout the group as it should and winners are kept track of on-screen. This may only be a “beta” release, but it seems to work quite well. Having a party this weekend? You could give this a shot.